"I sometimes wonder whether you and all the grand Reformers can talk yourselves into believing that the question and the number and the nature of the sacraments is really more important than whether those who receive them live or die." 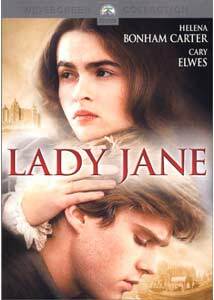 Released in 1986 and quickly forgotten, Lady Jane is more notable today for the feature film debut performance of Helena Bonham-Carter than for its reputation as a historical drama of merit. Perhaps that's understandable. Bonham-Carter has gone on to a celebrated career and multiple awards. Lady Jane, though she was briefly Queen of England, was a figure so obscure, she warranted nary a mention in my History of Western Civilization class last semester. Sandwiched between such royal celebrities as Kings Henry VIII and Edward, and Queens "Bloody" Mary and Elizabeth I, the inconsequential nine-day rule of the very young, ineffectual Queen Jane doesn't seem like much. Fortunately, the film doesn't try to paint Jane as an influential historical figure. The focus instead is on her private life. When Jane was 15, the young King, Edward, who had always been sickly, was dying. In a scheme to retain protestant control over England (established by Henry VIII, who cut himself and his people from the Catholic Church), the Council, led by John Dudley (John Wood) and Jane's father, Henry Grey (Patrick Stewart), convinced Edward to pass the crown to Jane, his cousin, keeping it from the hands of his sister Mary (Jane Lapotaire), a devout Catholic. The political intrigue is certainly downplayed, and the characters who place Jane in power are barely featured. And though I certainly wouldn't complain about the extended screen time for Patrick Stewart, perhaps the focus on Jane herself is for the best. It's easy to think of history merely in terms of facts and occurrences; it's more interesting if the characters are humanized. Thus, as the film dutifully chronicles Jane's rise, rule, and eventual execution, we care less about what is happening than who it is happening to. Helena Bonham-Carter, looking quite young, gives an affecting performance to be sure. Perhaps she's a bit too modern�I can't imagine the real Jane was quite as petulant and rebellious�but she succeeds in shaping a nuanced character from a script that does her no real favors. The majority of the running time is spent on what should be a rather insipid romance between Jane and her husband Guildford Dudley (Cary Elwes), a romance with no apparent factual basis. The two are painted in broad strokes as romantics and idealists, eager to reform the laws and edicts that have impoverished the citizenry even as the Council's wealth grew. David Edgar's script is full of bombastic monologues for them both, packed with ponderings on the crimes of Catholicism and the nature of the sacraments, and just as many similarly stilted proclamations of love, but the actors have a wonderful chemistry and innocence that redeems the material. Director Trevor Nunn, who has before and since worked primarily in British television, seems stuck in BBC mode, allowing scenes to run on but capturing them with no particular style. Perhaps the material would have been more suited to a miniseries; such is certainly true of Nunn. The production is impressive, though not lavish (I suspect the sets and many of the costumes are part of the stock English Historical Drama Design Repository), and it's kind of funny that a film about a woman who cared for the poorer classes features so few of them. Image Transfer Review: The quality of this image is a bit dodgy, and it's difficult to know what perceived deficiencies are due to director intent and what can be attributed to a less than stellar transfer. I suspect it's more of the former. The color palette is very muted, and fleshtones come across as unnaturally pale at times. Black level is only fair, and shadow detail is lacking a bit�definition is surely lost in the darker scenes. Film grain is visible but unobtrusive, but some scenes have an odd filtered appearance that makes it look as if it was either quite foggy on-set, or something was smeared on the camera lens. If you assume that these peculiarities are part of the look of the film, this is a decent transfer. There's some print damage, and the snowy opening scenes (where much of the screen is blanketed in white) look a bit unstable. Neither artifacting, aliasing, nor edge enhancement are a problem. Audio Transfer Review: For a 2.0 track, this mix sounds quite nice. Speech is anchored in the center channel with only minimal bleeding into the surrounds. The front soundstage is fairly broad, with good directionality and a nice, full presentation of the score. The surrounds are surprising active, frequently contributing atmospheric nuance, albeit subtly. There's a nice scenes towards the beginning where a character is walking through a large room and you can actually hear his footsteps echo behind you. Extras Review: The only extra is a rather bland photo gallery with about 30 behind-the-scenes and promotional stills. A by-the-numbers historical drama buoyed by two very fine performances from the charismatic young leads, Lady Jane will be best appreciated by history buffs and Anglophiles. Paramount's DVD is short on supplements, but the video and particularly the audio quality is quite nice (the new $19.99 price point doesn't hurt either).